Home / Stock Picks / Dividend Stocks / Should You Load Up on JNJ Stock Before Earnings? Should You Load Up on JNJ Stock Before Earnings? JNJ stock is consolidating nicely ahead of earnings. Which way will it break? Shares of Johnson & Johnson (NYSE:JNJ) have not been trading well, unlike the rest of the market. In fact, the JNJ has moved in the exact opposite direction as the market has over the past few several months. While the rest of U.S. stock market was taking a beating in October and November, Johnson & Johnson stock was one of a handful of names that kept on grinding higher. Of course, it helps that JNJ is a well-known blue-chip dividend stock that investors flock to for safety during bouts of volatility. In December though, investors dumped the stock after negative reports about JNJ surfaced. They allege that Johnson & Johnson failed to alert authorities that at times some of its baby powder products contained asbestos, something the company knew for decades. That’s a pretty bold allegation, particularly given the vulnerability of its customer. In any regard, J&J was quick to come out in its own defense and even issued a $5 billion buyback plan. Even sector M&A — highlighted by Bristol-Myers’ (NYSE:BMY) massive $74 billion deal for Celgene (NASDAQ:CELG) — wasn’t enough to give JNJ much of a lift. Although, the price has stabilized. The question is, will this report impact the company’s fiscal fourth-quarter earnings results, which will be released before the open on Tuesday January 22nd? I imagine that management will address the issue from a proactive position during the company’s conference call. I expect them to deny these claims and let their legal team do the heavy lifting. All management is looking to do is reassure investors that the company is not in the wrong — not that it will be the first time it has faced a major issue though. From a quarterly perspective, it doesn’t really matter. JNJ is all about building long-term moats and maintaining its place among the healthcare sector. This situation is unlikely to dethrone the company, even if it does cause some short-term waves in the stock price. Remember, many investors are in this for the long term. As it stands, analysts expect $1.95 in earnings per share for the fourth quarter, representing 12.1% growth year-over-year (YoY). That’s impressive growth considering that revenue estimates actually call for a 0.1% contraction to $20.17 billion. Also worth pointing out is that earnings estimates haven’t really budged even amid these baby powder reports. 30 days and 60 days ago, analysts were looking for $1.95 in earnings per share and 90 days ago they were looking for $1.96 in EPS. Current estimates call for earnings growth of 11.8% this year to $8.16 per share. However, 2019 estimates call for growth of just 5.5% to $8.61 per share. Revenue growth is expected to fall from 6.4% in 2018 to just 1.6% in 2019. In this respect, let’s see where management’s guidance falls and whether its better or worse than consensus expectations. So what clues do we see from JNJ stock price ahead of earnings? Shares have been consolidating nicely near $128 to $129 per share. It’s a surprisingly tight coil for a stock that’s been so quickly beaten down. Investors likely felt that $122 was too much of a selloff, but aren’t willing to bid the name up too much ahead of an event like earnings and after a damning baby powder report. It’s encouraging to see that the declining 21-day moving average did not weigh on the stock price and push it lower. Instead, JNJ stock traded right past it, like it wasn’t even there. However, the stock isn’t showing any willingness to trade through the 200-day moving average and ~$132 level. Investors who love JNJ for the long-term can justify adding to their position here, some $20 off the highs we saw in December. However, they should also realize that a decline down to the December lows is possible should JNJ disappoint investors next week. Also keep in mind that the market has rallied like mad over the last three weeks. A pause or decline could weigh on JNJ stock, which has largely sat out the rally this month. From a trading perspective, I would use a close below $128 as my stop-loss. 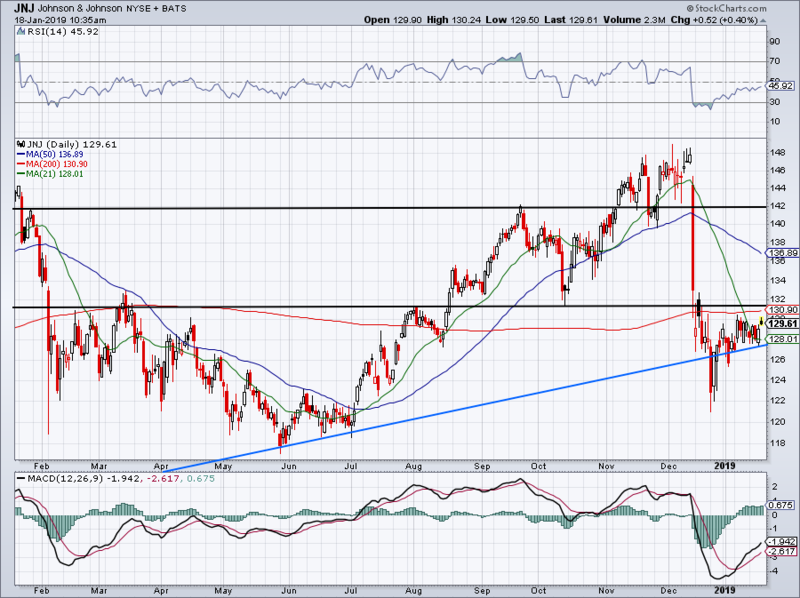 However, because earnings are involved, it’s very possible that whatever direction JNJ trades in could be a gap move. On the downside, look to see if its December lows near $122 hold as support. If it can clear and close above $132, bulls may consider buying a Johnson & Johnson stock breakout. Bret Kenwell is the manager and author of Future Blue Chips and is on Twitter @BretKenwell. As of this writing, Bret Kenwell is long CELG. 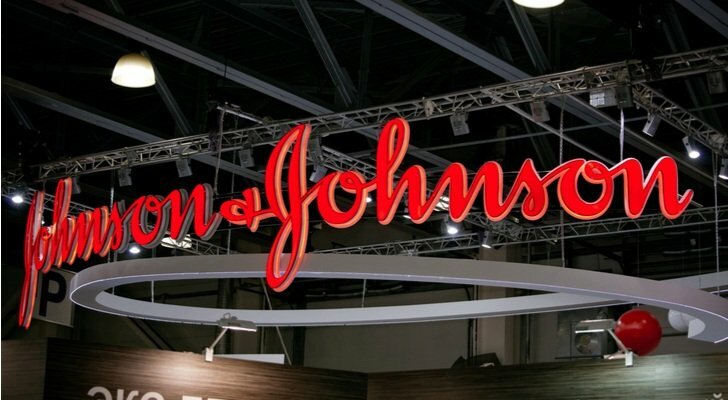 Article printed from InvestorPlace Media, https://investorplace.com/2019/01/should-you-load-up-on-jnj-stock-before-earnings/.